Controversial reality television star, Cee-C, has been threatened with an acid bath by a fan of other former housemates of Big Brother Naija. Big Brother Naija 2018 finalist, Cynthia Nwadiora, popularly known as Cee-C, has taken to her Instagram to reveal to her fans and supporters that she has just gotten an acid attack threat from a fan of other housemates over grudge borne from the aftermath of the reality show. 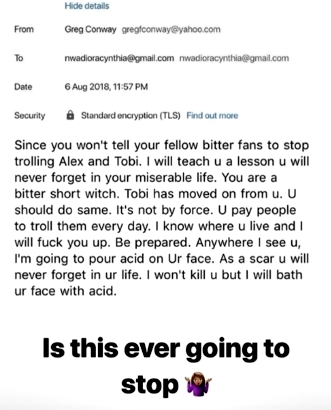 The acid threatening fan who wrote an e-mail to the TV star, alleged that Cee-C pays people to troll on other ex-housemates of the reality show - Tobi and Alex, and she has failed to call her fans to order. The suspect ended up threatening to leave Cee-C with a scar she will never forget, adding that he knows where she lives and will douse some acid liquids on her.